It literally took me to Africa and I walked on their soil along with the Price family. It is the first novel I've read by Kingsolver, but it will not be the last. She is now a part of my ever-growing "books to read" list! A friend and also the mother-in-law of one of my stepdaughters, Kay Roney, is who suggested I read the book. I need to call her and say thank you! A comment Kingsolver said about a book is, "But first, a novel has to entertain--that's the contract with the reader: you give me ten hours and I'll give you a reason to turn every page." She most definitely did that! My father was a minister for 50+ years. My life was nothing like this family's, but I was raised in a very strict religion. It was during a time when trends would not be my friend. The mini-skirt made it big debut during my high school years. I wanted so much to just "blend in" with the other girls. I didn't want to be different. I wanted to be accepted as one of the cool girls. Needless to say, I picked up some bad vices, trying to fit in. I'm certainly not proud of some of them for various reasons. One that I have regretted the most over the years was the habit of smoking! I was chained to those "coffin nails" for many years. As of August 13, 2010, I will CELEBRATE 3 years without.a.single.cigarette! Yay for me!!! Of course, that also being the date that I had my second stent inserted into my left anterior descending artery which is promptly dubbed "The Widow Maker", was most certainly a great motivator! One would think I would have learned my lesson with the first one on October 6, 1999. I did quit for some time but as usual, fell back into the habit. But not this time--no more--never again--the price is too high to pay. I have 2 wonderful sons and a wonderful husband, 5 wonderful grandchildren by my husband's 2 wonderful daughters and their husbands, 2 wonderful sisters, wonderful parents, wonderful nieces and nephews and their spouses, wonderful great-nieces and a great-nephew, wonderful cousins, aunts, uncles, brothers-in-law, sisters-in-law, am I missing anyone? If I did, it was not intentional. Oh my, I have really meandered off the path of this blog. I have gone all over the place! My oldest son, Jeremy, tells me to "stay focused" more than any child (of almost 34) should ever have to tell a parent. I feel as though my parents did make some decisions that they would change if they could, but what parent hasn't done that? I cannot fault my father for being so strict. I try to remember that he learned this behavior from someone else. I think it was probably his mother. She was a lot more intense than Grandpa was. If she had something on her mind, it was on your mind too before the day was over! Anyway, when you get a chance, pick this book up at your local Barnes & Noble bookstore, your local public library, or borrow it from a friend. I'm loaning it to a friend. She actually was my son's 3rd grade teacher. (Jeremy, do you remember Mrs. White?) She was in the "Master Gardener" class I just finished. It's a small world, isn't it? Well, my husband has spent the day in Augusta, GA at the practice rounds for the "Masters Tournament". He called just a bit ago to let me know they are on their way home. He also said he had taken well over 200 pictures and we could look at them when he got here. I am so excited and anxious to see what surprise he is bringing me, too! I love surprises, don't you? Well, don't forget now! 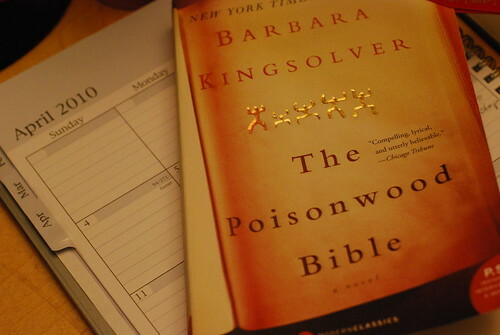 Put "The Poisonwood Bible" on your reading list. You won't regret it. I guarantee it! I am so sorry to hear that you lost someone you loved dearly. I didn't know that about you. You are right, one day you will be reunited with him again. You were given two beautiful loves in your life. Doesn't take away the pain of losing the first, but it is beautiful in itself. Thanks for the sweet comment. The photos are indeed from the D700. The flowers are really just that beautiful. The colors are literally that vibrant in real life. I have been messing around with the picture control settings on my camera to get a jpeg coloration that I like, and I'm getting closer. I'm having struggles getting vibrant colors but not having orange skin tones. I'll get there. I hope you are having a lovely week and thank you so much for tuning into my blog. It means a lot. Oh, and if you would pray for the Swenson family and for the spirit and soul of Lance Corporal Curtis Swenson, I would be forever grateful. His wake is Friday and he's being buried Saturday. It's devastating any time a Marine [or soldier or any person military] is killed, but it makes it that much more real to know that he has a wife and loving parents, a sister and a brother, who are now left with a hole in their heart. And to know that he actually served with my husband and my husband knew him. Thank you, and I know the Swenson family is appreciative too. This book was one of my favorites! I loved that book so much : ) I think I might like to read it again. Thank you for reminding me!